"During the month of September, seven Afghan students were considered absent without leave (AWOL) during international military student programs," Pentagon spokesman Cmdr. Patrick L. Evans said. The disappearance of the Afghans comes amid heightened fears of increasing Islamist terror attacks around the country. The attacks have included the New York area bombings and attempted bombings, a knife attack at a Minnesota mall by a Somali jihadist, and other regional shootings. Two of the missing Afghans had been training at Fort Leonard Wood, Missouri, and one was training at Fort Gordon, Georgia. An Army source said the Afghans who left the weekend of the New York area bombings appeared to be part of a coordinated effort. The three men are being probed for possible connections to Rahami. "Initial assessment is that there is not relation and the timing is coincidental," the source said. Evans declined to comment on whether the Pentagon has security concerns about the missing Afghans. Sarah Rodriguez, a spokeswoman for the Immigration and Customs Enforcement service, said authorities are pursuing the Afghans. "ICE Homeland Security Investigations is aware of the situation, and is actively working to locate these individuals in coordination with the State Department and the Department of Defense," she said, declining specifics because of the ongoing investigation. However, the service, which tracks illegal aliens, was notified of the missing Afghans. Four other Afghan military trainees fled over the Labor Day weekend, two from Fort Benning, Georgia, one from Fort Lee, Virginia, and one from an Army facility in Little Rock, Arkansas. A defense official said two of the Afghans were accounted for and suggested the two men may have fled the United States. 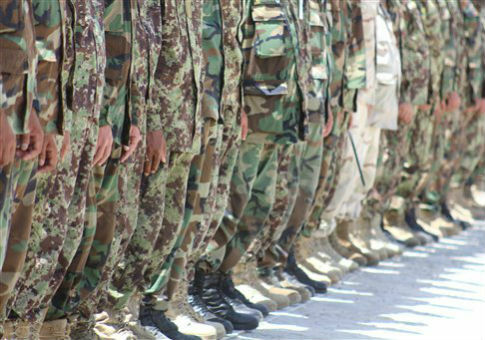 It is not the first time Afghan military students have disappeared. Two maintenance airmen from the Afghan Air Force disappeared from Moody Air Force Base in Georgia in December. One was later found in Virginia. Retired Army officer Joe Myers, who was posted in Kabul, Afghanistan, said the U.S. military frequently trains foreign military students as part of a security assistance and international training and education program. "It is not unusual at times for some foreign students to use the opportunity to not return to their country of origin," Myers said. "In the case of Afghanistan it is more sensitive for homeland security when their students disappear, especially in light of actual graduates of programs such as the new ISIS military commander, Gulmurod Khalimov, who attended and completed several State Department sponsored counterterrorism programs," Myers said. The missing soldiers were part of the International Military Education and Training program under the Pentagon’s Defense Security Cooperation Agency. According to the agency’s website, the military education is aimed at training future leaders, fostering a better understanding of the United States, and establishing closer ties between the U.S. and Afghan militaries. Evans, the Pentagon spokesman, defended the program to train Afghan troops. "It is important to note that the majority of Afghans who train in the U.S. successfully complete their training and return to their country," he said. "However, there have been occasions where [military officials] have learned of plans to go AWOL. In some of those cases, those students have been returned immediately to their country," he said. A manual for training foreign military personnel states that the training can include "potentially sensitive or lethal training." Foreign military students that are absent from scheduled activities for more than 24 hours are considered "AWOL." Once declared missing, details about the foreign military students are sent to military police as well as to the Defense Intelligence Agency, FBI, and U.S. Northern Command. A working group currently monitors the status of all missing foreign military students. The group is composed of officials from ICE, DIA, FBI and Northcom. Update 10:51 A.M.: This post has been updated to reflect comment from Immigration and Customs Enforcement. This entry was posted in National Security and tagged Afghanistan, Terrorism. Bookmark the permalink.